The 'WINDMOTOR' windmill is a copy of a version of the original 'AERMOTOR'. In 1913 W.SALMAN & Co, of the PERSEVERANCE IRON WORKS in Mt Barker, South Australia were selling the 'FEDERAL STEEL WIND MOTOR' and using the METTERS copy of the same American drawing from 1894. 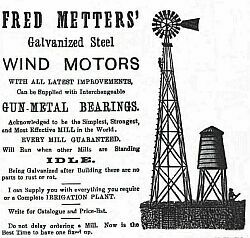 This same company advertised as making wind motors as far back as March 1899. The first WINDMOTOR was available in 8, 10 and 12 foot, versions, and made, so METTERS claimed, of the best British steel. In September 1899, a South Australian advertisement in The Garden and Field stated that [in their wording]:- "These mills have been greatly improved in the last few months. All bearings are fitted with oil boxes. Pump rod has been improved upon. I can now supply these mills with interchangeable gun metal bearings throughout. The blades of wheel are made of 18 gauge steel, galvanised after making, and all castings are alloyed with aluminium making them soft and strong." A 1923 source gives the bearing change as 1898, and as superseding fixed white metal bearings similar to those used on the 1888 'AERMOTOR'. The oil boxes are presumably the siphon feed lubricators mentioned in 1900 and again in 1902. The date for the next variation of the WINDMOTOR is not certain, but occurs before 1910. In this the governor bar and governor weight have been added, and this becomes probably the main distinguishing feature separating the WINDMOTOR from the AERMOTOR. Shortly after September 1909, fourteen foot models become available as well. This size was still sold in 1934. In 1910 brass hexagonal shaped split bearings in a hexagonal shaped casting were introduced, but only remained 2 years before reverting to cylindrical bearings. The 8 foot 1914 model had a number of features which differentiated it from other WINDMOTORS. The main gear revolved on its shaft and used a washer and grease cover which was bolted onto the main gear. 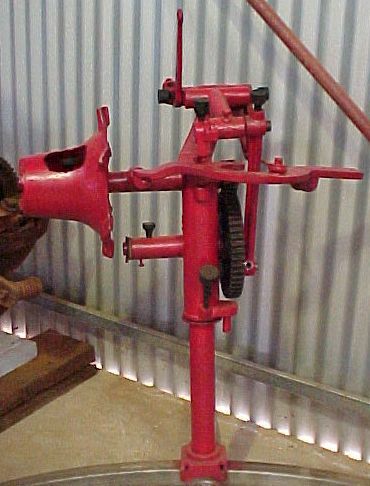 The pitman arm used with this model was cast as one with a hollow crank pin and held in place by a bolt. Normally WINDMOTORS had a separate crank pin which was keyed into the main gear. The end of the main casting where the hub shaft enters it has been widened to allow for machining of the bearing sleeve. The bearing has an oval flange with a notch cut into it, to accommodate the projection cast onto the top front of the main casting. Once the bearing was fitted it was held in place by two countersunk screws per bearing. The 1914 model range came equipped with cast, screw down grease cups and this became the norm. 10, 12 and 14 foot WINDMOTOR windmills supplied during 1914 were fitted with ball bearings, but reverted to brass bearings in 1915. The 1915 WINDMOTOR had several changes from the original. One obvious change was the wind wheel blades. Prior to this, the WINDMOTOR had used blades which were slotted to allow the outer ring to pass through them. From this they changed to place the blade on brackets, fully in front of the frame of the wind wheel. In 1902, 20, 30, 40 and 50 foot towers were available in either a galvanised or black iron state, and references were being made to a market with Queensland pastoralists. By 1920 towers seem to be restricted to a choice of 20 or 30 foot. This remained the same until 1934.